Shortly after Alberta’s finance minister delivered an optimistic prognosis for the province's fiscal health, a credit agency offered a less rosy view. Shortly after Alberta's finance minister delivered an optimistic prognosis for the province's fiscal health, a credit agency offered a less rosy view. Toronto-based DBRS Limited downgraded the province's long-term debt rating from AA (high) to AA with a negative outlook, saying the government "has yet to demonstrate any real willingness to address the weakest budget outlook among all provinces." On Tuesday, Finance Minister Joe Ceci announced that economic growth in the province would be higher than expected this year and the projected deficit marginally smaller. But in a news release Wednesday, DBRS said the outlook was not good enough. "DBRS is concerned that the plan to return to balance relies on a recovery in resource revenues, rather than fundamental adjustments to the budget. "As a result, debt will continue to rise and there is no clarity as to when the credit profile will stabilize." In a statement Wednesday, Ceci fired back that Alberta's economy is looking up and said the province is "carefully tightening" its belt while "protecting health care and eduation." 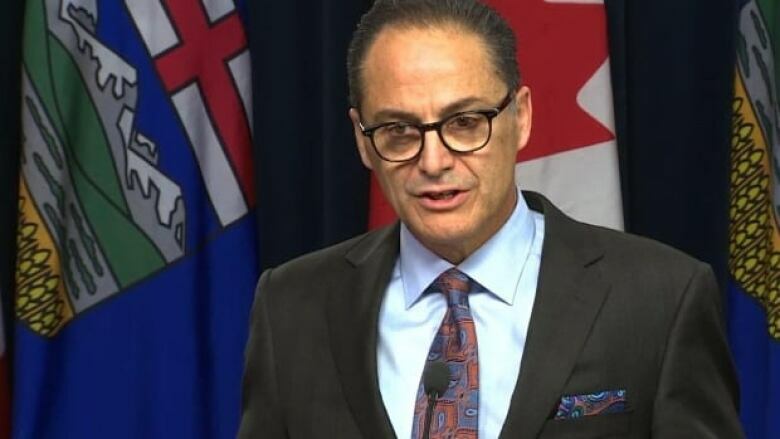 "The fiscal update released yesterday shows that Alberta's economy is growing faster than forecast, the deficit is coming down, and significant cost savings are being realized," Ceci said. But the credit rating agency maintained that deeper spending cuts are needed. "Proposed expense measures will be insufficient to meaningfully address the fiscal imbalance," the company said. DBRS said it would revise it's negative outlook if the province introduced a "credible plan" resulting in the stabilization of the debt-to-GDP ratio. The agency last changed its long-term outlook for the province in July, from stable to negative, while maintaining the AA (high) credit rating. ​In May, S&P Global Ratings downgraded Alberta's credit rating for the third time since December 2015, by two notches from AA to A+ due to the province's continuing deficits and accumulating debt. UCP finance critic Drew Barnes said the downgrade confirms the NDP is moving in the wrong direction. "From debt free not long ago to today having no real prospect of returning to a balanced budget, Alberta is at increasing risk of becoming a fiscal basket case," Barnes said in a news release. "With each downgrade, the cost to borrow gets more expensive. Yet, the NDP continues to borrow money it doesn't have."